When the long-awaited Resident Evil 5 arrives on March 13, it will be the first game in the legendary Resident Evil series to hit the Xbox 360. Duly excited by the prospect of their first Resident Evil title, the Xbox folks have announced a limited edition red version of their console to celebrate the incoming zombie shooter. On the same day that Resident Evil 5 launches, fans will be able to pick up* the game as part of a bundle including the crimson console with 120GB hard drive, a matching red wireless controller and a (disappointingly) black headset. Software-wise, buyers of the special edition machine will also get an "exclusive premium" Resident Evil 5 theme and a code for downloading Super Street Fighter II Turbo HD Remix, another Capcom title. The bright and bloody hue of this commemorative Xbox 360 won't be to everyone's taste. The classic white and black models do a better job of blending with the average home entertainment set-up, after all. But fans of faceplates might be tempted to trade up. 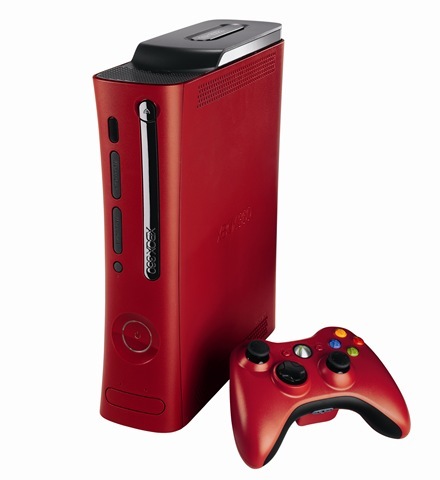 What do you make of this oh-so-red Xbox 360? Would you prefer another colour? And shouldn't a Resident Evil 5 special edition model have some kind of zombie design on it?